Another cold storm is blowing and I dream of soup when it’s cold. Don’t you? 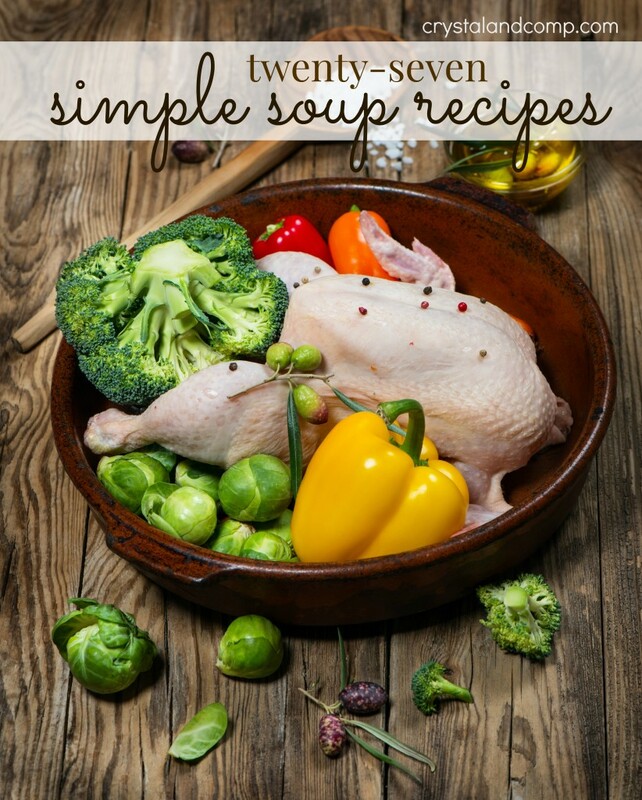 Here is a collection of my favorite simple soup recipes. These soups will stick to our ribs and keep you toasty inside. Chicken Orzo Soup– an extremely filling and yummy soup. Vegetable Beef Soup from Sweet Bella Roos. This looks hardy and deish. Alphabet Chicken Noodle Soup from The Taylor House. This looks awesome and perfect for an afternoon lunch. Make a batch and serve it all week at lunchtime. Corn Sausage Chowder from Dukes and Duchesses looks amazing. One of my sister-in-laws has been looking for a good corn chowder recipe for my brother…. this one looks perfect! Jewish Chicken Penicillin Soup– if you are sick this winter with all the crazy weather, this is the perfect family recipe from my friend Jennifer that will make you feel better! Southern Potato Soup from 3 Boys and a Dog. She promises this tastes like heaven. Taco Soup from Staci at 7 on a Shoestring. Her version uses Ranch Style Beans and stewed tomatoes. Quick and Easy Chicken Noodle Soup from Sweet Bella Ros. I love homemade chicken noodle soup that used wide egg noodles like this! Crockpot Vegetable Beef Stew from Life with Captain Fussy Buckets is perfect for those who love a tomato sauce based broth and want to use leftover meat to make the stew! 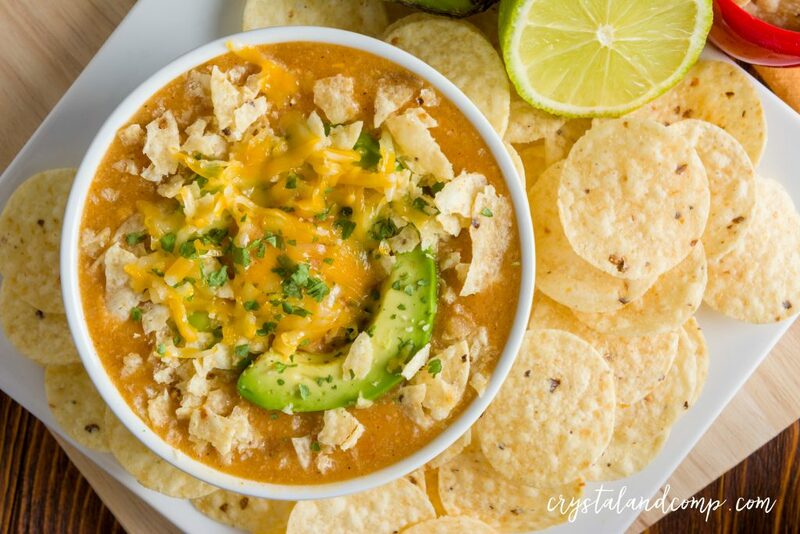 Turkey Tortilla Soup MamaChallenge shares a great way to use leftover turkey you may have frozen into an awesome soup. Chicken Tortilla Soup from A Nerds Wife. This looks so good and goes perfectly with slices of avocado! I am in love ! Crockpot Pizza Soup from 3 Boys and a Dog. This is something I bet you’ve never had before. Loaded Baked Potato Soup from Three Different Directions. This version uses frozen hashbrowns and is cooked in the slow cooker. Crockpot Chili from Life with Captain Fussy Buckets looks filling. If you like using and slow cooker and a meaty chili, this one is for you! Leftover Soup from 3 Boys and a Dog. I love what Kelli does with leftovers. Check this recipe out! Lasagna Soup Recipe from The Taylor House. This is a thick noodle soup with cheese, meat and tomaotes. Yum! Tasty Taco Soup from Pounds4Pennies. This version used black beans, is very simple and is cooked in your slow cooker. Puerto Rican Stew– a family favorite. No Fuss Potato Soup from Taste of Home. This is made in the slow cooker and features a nice amount of diced potatoes, some evaporated milk and a good amount of cheese! Yum. Easy Bean and Meat Chili– this comes together very quickly. Slow Cooker Cheeseburger Soup from The Taylor House. This will warm your soul. Beef Stew from Kitchen Genius. I love the collection of beans, meat and red hatch chile in this stew. Skinny Chicken Broccoli Soup from 3 Boys and a Dog. This is a healthy version of a popular soup and it includes asparagus too! Yum. Chipotle Chicken Soup fromThe Taylor House. She uses a store bought sauce as her base. Score! Easy Stove Top Taco Soup– serve it with chips or cornbread. What is your favorite simple soup recipe? Brittnei recently posted..Are You Hurting Your Reputation With Google And Other Bloggers? I was looking for something like this! It is perfect! Making one of them tomorrow – Just have to pick which one! ~Thanks!! Thanks so much for the great soups! Just what I needed for this time of year ! These will be great for Winter (we’re in Summer here in Australia) Thanks for sharing on Mummy Mondays. This is a wonderful collection of recipes to help warm a family up this winter. Thank you Jill. The Chicken Orzo is one of our favorites. This is a great collection of soups that all look delicious! Thank you so much for helping us celebrate Three Years at Full Plate Thursday. Have a great week and come back soon! Creatively Homespun recently posted..Tasty Tuesday 9/29 Link Party!